Naper Settlement's library contains several hundred volumes pertaining to the history of Naperville, DuPage County and the State of Illinois, as well as select topics of national interest. Research materials include collections of maps; published histories; family and genealogical studies; letters, photographs, newspapers and magazines; cemetery, church and census records; and city and government records. In addition to these physical archives, Naper Settlement's research staff can also assist with internet searches. 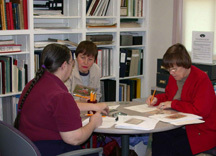 The library is open to researchers investigating their property, house or building construction; neighborhoods; genealogy; and town and county growth, culture, business and education. Students of all ages are welcome and encouraged. The Research Library is open to the public every Thursday from 10:00 am to 1:00 pm without an appointment. Appointments to use the library and its collections outside of these hours may be made by contacting the Library at 630.305.5259.